Personalized Baby Gift Sets -Pediatrician Kits in Bulk. Promotional, Inexpensive. Medicine Spoon, Dropper, Oral Syringe, Baby Comb, 7 Day Pill Organizer. Baby gift sets in bulk, custom imprinted, at the Budget Prices in USA and Canada. American clients pay no taxes. The bulk pediatrician baby gift set includes: Medical Spoon, 5 ml Medicine Dropper, Oral Syringe with Filler Tube, Baby Comb, Immunization Schedule Magnet, 7 Day Pill Organizer, Custom Imprinted Insert Card, all stored in a clear Vinyl Zipper Bag. Ideal for an expectant mother. Perfect gift for hospitals, doctors, day care centers and Lamaze classes. We also supply bulk blank (not imprinted) baby gift set: Please use Next-Column pricing. Free artwork design. We will send you a proof for your approval before production. Unit prices below include full color imprint on the immunization schedule magnet and the insert card. We also supply bulk blank (not imprinted) baby gift ses: Please use Next-Column pricing. Size: 4" x 6" x 1-1/2"
Product Colors : White, Blue or Pink. 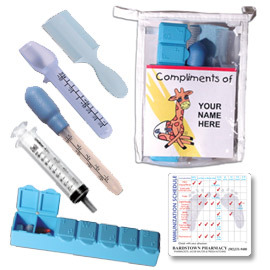 Components: Medical Spoon, 5 ml Medicine Dropper, Oral Syringe with Filler Tube, Baby Comb, 7 Day Pill Organizer. Immunization Schedule Magnet custom imprinted in full color. Insert Card custom imprinted in full color. Production Time: 7-10 business days from artwork approval. The perfect gift for an expectant mother.